Can you spot the turnips and the onions? Me neither! 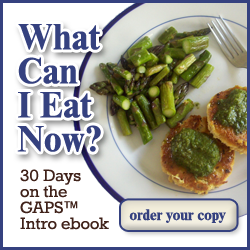 One of the best things about the GAPS diet is what it has done for our picky kids. We once had one sugar-crazed kid who wouldn’t eat meat and one meat-crazed kid who wouldn’t eat vegetables. While things are still far from perfect, at least our vegetarian is eating meat and our carnivore is eating more vegetables. They will now eat nearly any vegetable. Except for turnips and onions. Which I totally understand! Onions are slimy and turnips are squishy. What’s the best way to get around these textures? Puree! But we don’t want puree all the time. Sometimes we want chunks, too. My genius idea? Puree the stuff the kids don’t like, then add the veggies and meat they do like! I felt so smart. Additionally, the turnips and onions thicken up the broth, making this more like a stew. It’s pretty awesome. Make sure you peel the whole outer layer – it’s bitter – off of the turnips. You can see it’s a bit more opaque than the rest of the turnip. Bring stock to a boil and add garlic, onions, and turnips. Reduce to a simmer. Simmer 20 minutes until turnips are tender. Using your stick blender, puree in the pot. Careful not to splash yourself! If you don’t have a stick blender, you can use a regular blender and work in batches. Bring puree to boil and add beets and carrots. If using ground beef, form 1″ meatballs and drop into soup. If using stew meat or leftover roast, cut into bite size chunks and drop into soup. Reduce to a simmer. Simmer 20 minutes until beets are tender. Serve with sour cream or yogurt, homemade sauerkraut, and fresh dill. This post is part of This Week’s Cravings, Lunchbox Love, and Sunday Soup Night. This sounds like a really tasty, nourishing soup. I keep meaning to try making a borscht-style soup, I should just go and do it! Thanks for sharing this with Sunday Night Soup Night, look forward to seeing you again soon!